Holidays are special and most of them come only once a year. For this reason, nothing is more exciting and memorable than sharing a decent meal with friends, loved ones or acquaintances during the holidays. But what if you’re the one preparing the meal? Well, for most people, creating a great holiday meal can prove to be a daunting task, especially when you want to wow your guests and keep their taste buds eager for the next invite from you. In a nutshell, this may rarely be the case without proper planning, research (especially recipes), and seeking assistance. 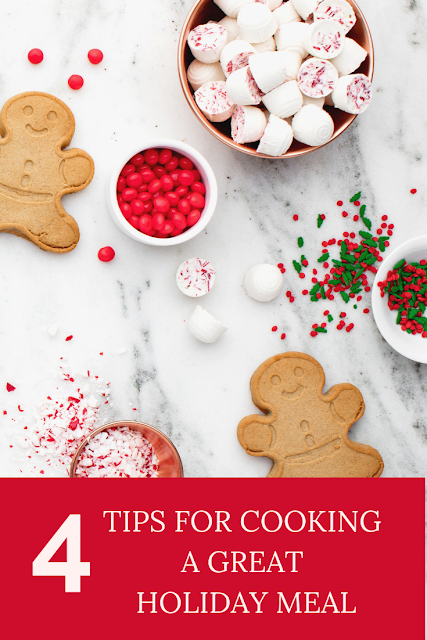 Nonetheless, here are 4 tips for cooking a great holiday meal. Planning your meals in advance will help you save a lot of time in the kitchen and from wandering around in grocery stores pondering on what to cook. It really doesn't matter if it’s a quick and easy meal or a buffet. It's always important that you decide what to cook in advance and get the necessary ingredients/requirements early enough before the D-day. Before You Start Cooking Getting the right ingredients is barely enough when looking to create a great holiday meal. What you put into the cooking pot should be just the right measure. To get it right when preparing your holiday meal, you’ll want to invest in a digital kitchen scale that allows you to weight your ingredients in grams, milligrams, ounces, and so on. Measuring ingredients in the kitchen is key ensuring consistency as far as food quality, taste and flavor are concerned. It also helps to reduce wastage and control your kitchen costs. The fact that you'll probably be cooking more than you usually do, can be reason enough to allocate duties to trusted members of the household. They don’t have to do much, easy tasks will take a load off your table to give you time to concentrate on other areas of the kitchen. Furthermore, cooking under pressure can ruin the whole recipe. Additionally, it's fun cooking when you’ve got people pitching in, not forgetting that it can be a great time to socialize as you all contribute to making a great holiday meal. A recipe book can also come in handy, especially if you’re out of ideas or you’re completely clueless about how to cook a certain meal for holiday. There are many recipe books that you can choose from, including some that focus on holiday meals. Alternatively, you can also search recipe ideas, cooking tips, and guides online from YouTube, culinary websites, and cooking social forums. You will find plenty o these on the internet. Recipes will help you to know exactly what ingredients to use, the utensils to use, the cooking procedure, the recommended cooking time, the appliances to use, and even the amount of heat to utilize. In addition to the above, your meal preparation process will always be affected by the cooking appliance/s you use. Can your roast or bake a turkey using a coffee maker? Of course not! Even when you bring the best of your cooking expert skills, a microwave or barbeque grill may not be relevant if you’ve planned to wow your holiday guests with some mouth-watering tacos.